This morning, I found a nice email in my inbox from the Vancouver Symphony Orchestra, announcing that tickets were still available for Mahler’s Symphony of a Thousand, being played in celebration of the Olympics being held there in about 15 days. This, combined with my not-calling my parents for the last week because of exams, made me super, duper homesick. And I have an exam on Monday, too, so what do I do? Those that are familiar with the Vancouver restaurant scene know that one of the defining features of West Coast cuisine is the abundance of seafood. So what better way is there to give myself a taste of home than to make a salmon filet and put it on a minimalist plate (chichi presentation is another defining feature of Vancouver, for sure). I passed by the fish shop in the Diskontopassage today to buy some fresh salmon, but since they were closed by the time I got there, I had to settle for frozen from Rewe. Fresh fish cooks easier, I think, but that’s kind of rare here in Germany, since we’re not near the ocean like Vancouver is. Oh well. Make the mashed potatoes, either from scratch or according to the directions on the package. If you’re in Germany, the addition of some milk and a smudge of Kräuterbutter (about half a single serving, or the whole thing if you’re feeling indulgent) make the potatoes melt-in-your-mouth good. If you’re not, I’m sorry. Add the minced garlic, peanuts, and some salt to taste. Set aside. Blanch broccoli in hot water for about a minute, no longer (want to keep the broccoli as green as possible)! Grill the salmon in a well-oiled, hot pan. Sear for about a minute, then cover with a lid to allow the rest of it to cook through (about 3 minutes, but this depends on the thickness of your filet). Mash the basil leaves with a pinch of salt and the olive oil. I did it guerilla-style in side a cup with a spoon (I don’t have space for a mortar and pestle!). Definitely reminded me of Vancouver, and was also an excuse to try out my awesome new macro tent (an idea I got here from Flo – Flo, BEST.IDEA.EVER. I do need a stronger light source, though – I don’t have off-camera flash…or an SLR, for that matter). The potatoes were super garlicy, just the way I like them, and ensure that I will not be going anywhere tomorrow; the peanuts added a nice crunch, too. 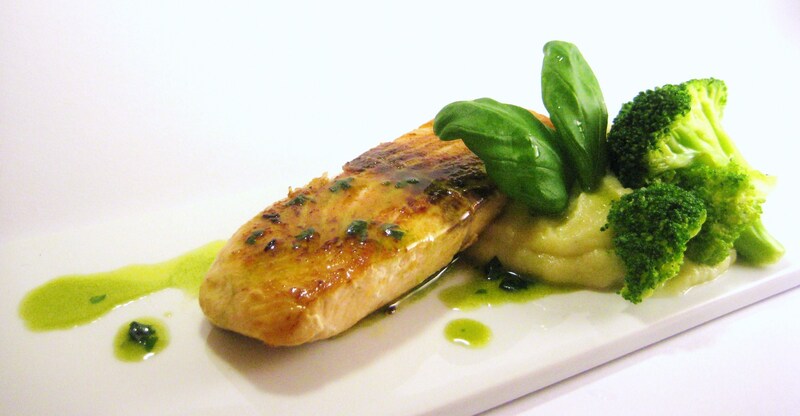 The basil oil was surprisingly nice with the salmon – the Mensa usually serves fish with some kind of cream sauce, but I think West Coast cuisine tends to be a bit lighter and healthier. I have a small pot of parsley in my room. I am very pessimistic about how long it will last before it dies. Haha, I bought one of those herb pots from Kaufland for my Christmas Lunch too. I think they can last for a long time. Too bad I went on vacation and forgot to ask my roommate to water it. It was beside a very cold window for about three weeks. I’m still trying to revive it now, hahaha.